Free Hospital Wifi – Nearly There! Those who know me will be aware that I have been campaigning for free patient access to wifi in NHS hospitals for more than 10 years. For most of that time I felt like a voice in the wilderness. In recent years the support has gathered, and, in the last year at least, it has felt like there was a momentum behind the idea. And now…. the moment has not yet arrived, but the door is open. Today, Martha Lane Fox published her “Digital Recommendations for the NHS“. Among the recommendations are that all health staff should have digital skills, AND, that there should be free wifi for staff and patients across the NHS estate. I know from experience that there is a long distance between recommendation and implementation, particularly in an NHS which is actually made up of a plethora of autonomous units. But the recommendation is there, and it has a budget behind it. So, maybe the Campaign has won. But still join it any way here to make sure the momentum is maintained. I still encounter so much resistance to the adoption of new technologies in public services. One particular battle is about the use of remote consultations in healthcare. Yesterday, Hilary Garner told me a very powerful story about what happened when a family member was taken ill in Germany recently. He is sure that the care given was dramatically improved by the doctors’ ability to remotely consult with an expert remotely via Skype, at 1 o’clock in the morning. It was all done in perfect English as well, and, as Hilary explained, the remote consultant was able to reassure him directly about the course of action taken. People think that remote consultations are impersonal. But, would you rather have access to the expertise of one doctor, face-to-face, or the collective expertise of many doctors via Skype? I’m relatively optimistic that we will see significant progress towards wifi in hospitals becoming the norm in the not too distant future, particularly as recent NHS announcements seem to be indicating an exploration of allowing the public (or “patients”) to access wifi across the whole of the NHS estate. There have been some conflicting messages on this, with some suggestions that the wifi ambition is limited to staff access. But I believe it will not stop at that. That doesn’t mean we need to be complacent, as one of the big issues is that the autonomy of individual institutions makes it next to impossible to mandate common procedures across what is a massive organisation. But I am confident the tipping point will soon be reached when it becomes an anomaly that a hospital lacks free patient wifi, such that public pressure will cause the laggards to come to the party. Around a third of NHS hospitals (and virtually all private hospitals) in the UK now have patient wifi. And despite the doom merchants and the gatekeepers, nothing bad has happened. I still come across the old arguments about patient wifi interfering with equipment (as if patient wifi is a different flavour of wifi to that used by staff), being expensive to deploy (not true), or offering a backdoor route into compromising patient confidentiality (can anyone point me to an example of this happening?). If any of these arguments were true do you not think there would be a story about them in the Daily Mail every day? There isn’t, because it doesn’t happen. And if it doesn’t happen in the one third of hospitals which have patient wifi, why should it happen in the other two-thirds? And you can also bet the the private hospitals which have patient wifi have done it for reasons concerned with patient satisfaction. Being cut off from regular contact with the outside world is a significant stress factor when you are in hospital. Patient wifi thus has a therapeutic benefit, and to deny it is to delay people’s recovery. Thus, it is probably true that lack of patient wifi is costing the NHS in terms of longer stays in hospital. I’ll be testing some of this out myself shortly as I embark on the DigiWards project. In the mean time, if you haven’t already, please join the Campaign for Free Hospital Wifi, use the #hospitalwifi hashtag on twitter, and help us keep up the pressure. One of the advantages of being a freelancer is you often get to work with some very special people. For a long time now I have wanted to work with Victoria Betton whose work I have admired for a number of years. Victoria inhabits that land between the big health services and the outside world, with an uncanny ability to communicate with both, and to make things happen by bringing insiders and outsiders together. Yesterday we had the kickoff meeting for a project we are calling DigiWards. We’ve been fortunate enough to secure some funding via the Tinder Foundation from the NHS Widening Digital Participation Fund. Using this funding, we intend to “digitise” 4 wards at the Mount Hospital, in Leeds. The Mount provides in-patient services to older people with mental health problems and dementia. As part of the project, free wifi is being installed into the wards (a cause close to my heart), and tablet devices will be made available for use by patients and carers. My role in the project is to provide training and support to cohorts of Digital Champions from within the hospital’s clinical staff and volunteers. I will further be involved in supporting the digital champions to deliver a range of digital engagement activities with patients and carers including digital tea parties, digital drop-in sessions, digital carers’ sessions, and digital walks (real-time walks, live streamed to patients on the ward). This is a great opportunity both to work with some lovely people, and to implement some of the ideas I have been working on for a while in a new context. We are pretty confident that these will be the first fully digitally-enabled older people’s inpatient wards in the country (let me know if you know otherwise). I can’t wait to get started, and I will, of course, post updates here. I am still hopeful of progress in the campaign to get free wifi for patients in all NHS hospitals, particularly after what Tim Kelsey said at an event I was present at in March (see here). But, you know what’s really frustrating? There are a number of cases where hospitals have installed wifi and yet the patients still can’t access it because none of the staff who have regular contact with patients know anything about it. While visiting my own local hospital, I asked at the information desk how to access the wifi and was told that no one there knew. Can someone please spread the message that it is pointless installing wifi if patients can’t access it. This is doubly frustrating for disconnected patients. 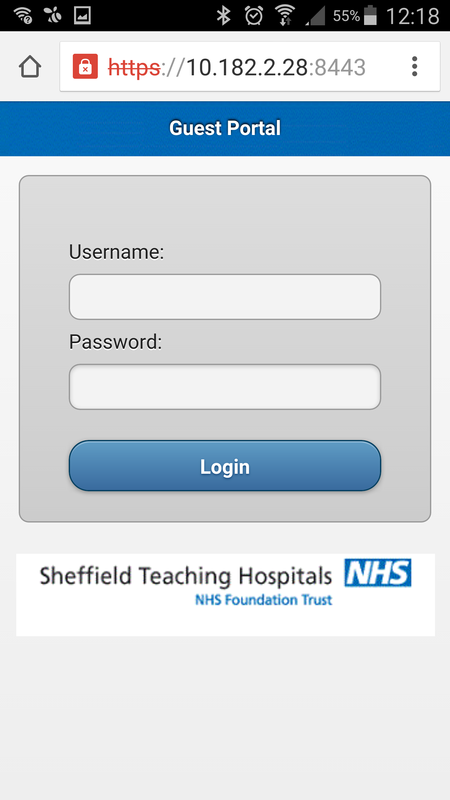 Here’s an example of a hospital wifi login screen. I was unable to get online. Although we have made significant progress with influencing hospitals to introduce free wifi for patients (I estimate that around 25% of NHS hospitals now have wifi – some of it charged for), there is still a very long way to go; that 75% remaining represents a lot of hospitals, and even where wifi is in place, people still struggle to get online and use it effectively. The number of visits to this blog which come from people searching for ways to get online in their hospital has convinced me that there is a pressing need for a lot of support in this area. I maintain that there is no argument that having access to the outside world via free wifi is an essential element in patient recovery. That message has failed to get through to many who run NHS hospitals, and it is also clear that the installation of wifi is not enough to solve the problem as many patients still can’t use it due to lack of knowledge on the part of the staff. run demonstrator projects which prove the benefits to patient recovery. Anyone got any ideas of where we can get some money? Some more thoughts on the debate about older people and “digital skills”, further to my post of a week or so ago. As well as saddling the objective of getting older people online with a prohibitive price tag of £875m, the debate is also being increasingly framed around “teaching” people “digital skills”. I believe, from my own experience of working with older people, that this is the wrong way to approach it. Now, if I am an older person, retired from the labour market, why would I see a need for someone to “teach” me “digital skills”? Surely that is for someone who needs to do such things as part of their job? My preference is that, rather than employing “teachers” to “teach” digital skills, we need to find ways of incentivising people who love digital technologies to pass on that love to people who have yet to come to the party. This, I believe, would both be a more effective approach, and would be likely to be delivered much more cheaply than £875m. Digital technologies can be fun, life enhancing, and socially beneficial. People who are not on board are missing out on all of these benefits, and we need to show them that. One of the things I don’t get when working with older people is the tendency I have witnessed of many, professionals and others, to treat them like children. I think this contributes to their exclusion from digital technologies, with some thinking it is their duty to protect them from new and scary things. New technologies can both open up older people’s horizons to new experiences and connections, and be used to remind younger people that older people were once young themselves. We can use video, audio and photography to enable older people to tell their life stories which can have positive benefits for themselves and can act as a signal to others that these are people who have been active, with varied roles. And I also don’t get the obsession with the 1930s and before which some people working with older citizens have when setting the context for events. Someone who is 75 now was 15 in 1954. As most people’s musical and social preferences are set in their teenage years, they are far more likely to be Rock ‘n’ Roll fans than to have an appreciation for Vera Lynn or George Formby. Older people are becoming increasingly digital confident. But both the ability to continue to participate in the digital world, and to be introduced to it for the first time are threatened by “gatekeepers” who want to protect them from it, and by the system’s inability to cater for such needs. Thus, a lot of older people spend time in hospital, where, as I told BBC Radio 4’s “You and Yours” programme, there is unlikely to be free wifi to connect them to the outside world. The interview from this programme is below. And the lack of digital infrastructure in care homes should be a national scandal. Those which are trying to address this, like the home in Newport which I visited last year (see video below), are all too rare. On 29th May I appeared on BBC Radio 4’s “You and Yours” programme talking about the need for Free Wifi in Hospitals. The feature is below. Thanks very much to “You and Yours” for raising the profile of this vital issue.